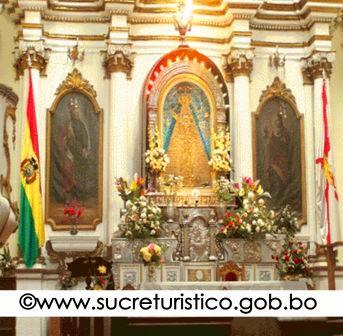 The Metropolitan Cathedral, or Catedral Metropolitana of Sucre, Bolivia may be one of the most ornate and beautiful churches in all of Bolivia. Construction on this magnificent structure, located on the corner of Sucre’s center square Plaza 25 de Mayo, began in 1559 and was completed in 1712. Here mass takes place every Sunday and Thursday at 9:00 a.m. The relatively simple exterior has several wonderful hand-carved wooden doors. If you note carefully, the door knockers are placed high above the street level. That’s because centuries ago visitors were more likely to approach the gates on horseback; thus the knockers are placed at a level that would have been easily reached by someone seated on a horse. The cathedral also features a lovely cast iron gate on Nicolás Ortíz Street, to the left of the main entrance of the church. On the plaza side of the church, next to the Prefecture building, you’ll see a separate entrance that looks like a beautiful stone gate. This leads into the Chapel of the Virgin of Guadalupe. The church has a unique steeple on which you’ll see statues of the 12 Apostles of Jesus along with a fully functioning clock that is over 200 years old. Metropolitan Cathedral Sucre Bolivia Slideshow: BoliviaBella.com’s trip to Sucre was created with TripAdvisor TripWow! Inside, the cathedral is stunning. It’s many pews are all hand-carved and numerous antique imported crystal chandeliers hand from the ceiling. Through various stained glass windows, the sunlight shines in, causing the many intricately painted details on the walls, altar and choir chairs to shine. They are, of course, hand-painted with pure liquid gold and silver. Large religious oil paintings, several centuries old and painted by famed artist Montufar, line the walls along with numerous statuettes representing various saints. What stands out most in this church is the Grecian-style “pagoda”, the center focal point of the Metropolitan Cathedral. This is the altar, and is crowned by a peculiar silver cross called the “Cruz de Carabuco” styled from silver. Behind it is one of the most beautiful sets of choir chairs, ornately carved and colorfully painted, each with a velvet seat and headrest. The white and gold-detailed pulpit is also gorgeous, and topped by a statue of an angel dressed in centuries-old style of clothing worn by Spanish soldiers. What you won’t see immediately in the Metropolitan Cathedral, is the Capilla de la Virgen de Guadalupe (Chapel of the Virgin of Guadalupe) which is hidden through a large wooden door to the left of the altar. This chapel can be accessed by visiting the “Museo Eclesiastico” or “Religious Museum”. The Museo Eclesiastico has many antique oil paintings, statuettes, gold and silver pieces used in Catholic services long ago, robes used by the priests delicately embroidered in real silver and gold thread, and other sacred art. The chapel is beautifully decorated and its central feature is what used to be a painting of the Virgin of Guadalupe holding the Christ Child. However, visitors used to pin jewelry and precious gems onto the part of the painting that was her robe including diamonds, rubies, emeralds, pearls, and even watches until finally, it began to fall apart. The painting, created in 1601 by Friar Diego de Ocaña, had to be reinforced in 1784 by stretching what was left of the fabric onto a gold plate. The gems and other gifts that had been left were encrusted into it, and today, all that is left of the original painting is the Virgin’s face and hands, and the face of her child, Jesus. The remainder is completely encrusted with gems. Photography is allowed in the Metropolitan Cathedral, but is not allowed in the Museo Eclesiastico or in the Chapel of the Virgin of Guadalupe. You can obtain permission to take photographs only if you take a letter of request and fill in some forms indicating the exact purposes for which you plan to use your photographs. Your request may be denied even if you do so. The government is very careful about Bolivia’s art heritage. Mass at the Chapel: Daily at 8:00 a.m. and Sundays at 10:30 a.m.
Mass at the Metropolitan Cathedral: Thursdays and Sundays at 9:00 a.m.
Museum tours: M-F from 10:00 a.m. to 12:00 noon and 3:00 – 5:00 p.m.